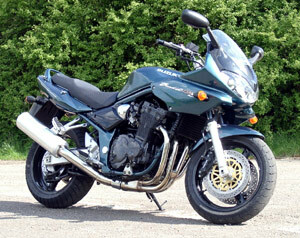 Suzuki 1200 Bandit - Hooligan bike - or tame sports tourer? A few years ago the Bandit had a name as the hooligan bike to top them all, this was in fact reinforced by the many stunt riders the world over who bought them as a dedicated stunt bikes. Most of this popularity came from its bullet-proof engine, a four-stroke, OHC 16v air-cooled, 1157cc in-line four, an engine with a heritage going back well into the 80's and the infamous GSX-R1100. The Bandit has made a leap forward in the comfort since the original version was launched. The Bandit S on test comes with a frame-mounted half fairing, a sizeable screen and a set of the largest mirrors I have seen for some time. The fairing works well and certainly does the job of protecting the rider at higher cruising speeds in most weathers, and that wide, plush seat is positively luxurious - for both rider and pillion. Pillion comfort is good in every department with plenty of leg room, a relatively low seat height and an easy-to-use grabrail. Also a little known fact is that the only reason stunt riders don't buy the faired versions is they can't sit on the handlebars! The engine is the thing that really shines on the Bandit, in fact I would say it really is the bike's best feature. You are greeted with an immense amount of torque available from just over tickover, max quoted at 67.5lb-ft @ 6500rpm, and it comes on smoothly and strongly as the revs sweep up through the mid range. The Bandit puts out enough power everywhere (98.6bhp) to keep anyone happy, but between 4000rpm and 7000rpm is really quite impressive. At just a shade over 3600rpm you'll see 70mph on the speedo with the five speed gearbox, 5000rpm passes the 100mph mark and the rest just comes on strong up to a 145mph-ish top speed. The Bandit does wheelie, even with the fairing and it's 220kg dry weight! In fact I would go so far as to say that they happen with ease, and if I can do them then anyone can! Mods over the old model include some 116 changes, the key improvements being TPS (Throtle Position Sensor) system on the bank of 4 36mm Mikuni carbs, revised cam profile, a larger oil cooler and a stronger clutch. The clutch and gearbox are typical Suzuki, light, responsive and positive, and vibrations have been adequately dampened. Don't get me wrong here the Bandit does vibrate but not really until it reaches 5000rpm, here they are at their worst but aren't really a nuisance beyond blurring the mirrors. Talking of mirrors, personally I think that they just stick out too far and are almost an afterthought. Having had to filter for rather a long way on the notorious M25 I found out that it's there that they really do get in the way. I actually ended up folding them back to get through the gaps in places, it was really the only way to make progress on that trip! So in traffic and around town (if you have the mirrors back!) the bike's a gem, and it's incredibly flexible. The Bandit can be all things to many riders, it's just as happy to be ridden at a sedate pace and go down to the shops or to take it out for a weekend thrash down your favourite lanes. The suspension is compliant and will give you good feedback. It is adjustable at the rear for preload and rebound, and at the front just for preload. You may find it needs a little more preload over the standard settings as it does tend to be a little on the soft side for spirited riding, but a little adjustment makes a whole load of difference. After a particularly good day out with the Bandit I was genuinely surprised. For a bike that is priced competitively and has a good specification, and bearing in mind the almost non-adjustable forks, this bike handles really quite well. Suzuki have marginally reduced the wheelbase, rake and trail over the old model, while the front fork spring rates and modified rear shock are claimed to have improved suspension performance, and I can't disagree. On the braking front we have a set of six-piston Tokico front brakes, and they are very effective indeed. The impression from the front is one of confidence with stacks of stopping power and a reasonable amount of feel at the lever, although I did find the rear brake is probably only adequate for the job. The Bandit, in reality is pretty nimble for such a big machine, it comes with plenty ground clearance, is easy to ride, inspires confidence and takes the majority of average road bumps in its stride, although the suspension is a little on the soft side. If you're looking to get your knee down on every corner I would say don't get a Bandit 1200, look at a Supersports bike instead. If you want a bike for everything including two-up touring, then this is probably the bike for you. 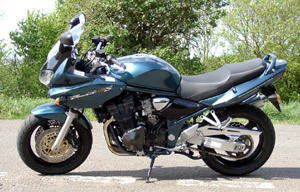 A high degree of rider and pillion comfort, plenty of power, a large fuel tank (20lt) and a good range (155miles to reserve - then you have 3 lts) all make for an ideal tourer. 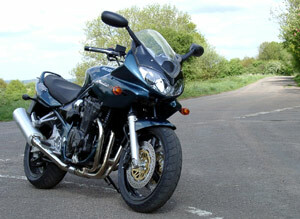 With the Bandit 1200S you get everything rolled into one for a genuinely low budget. The Bandit has always been a good bike, now with the fairing on the S version it has softened lines over the naked bike and in my mind it is firmly in the Sports Tourer bracket. But don't forget the other side of the Bandit, it's a city bike, an everyday commuter or a weekend cruiser, on your own or two-up it does it all well, it genuinely does everything its meant to and left a smile on my face when I got off, you can't ask for more than that. Only one thing to say now - Suzuki please do something about those mirrors, they are too wide and too far away, it's the only thing that spoils the bike! 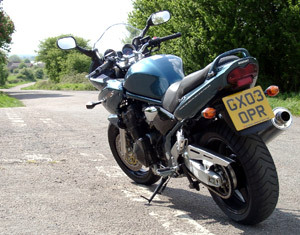 Read external Suzuki Bandit 1200S reviews on ciao.